Collard green wraps make these tacos one of the healthiest dinners around. With a bright citrus slaw & tangy sunflower cream, they're delicious, too. I love tortillas as much as the next person. Actually, I take that back. I probably love tortillas more than the average person, but today I’m ditching them to wrap taco-like things with green wraps instead. 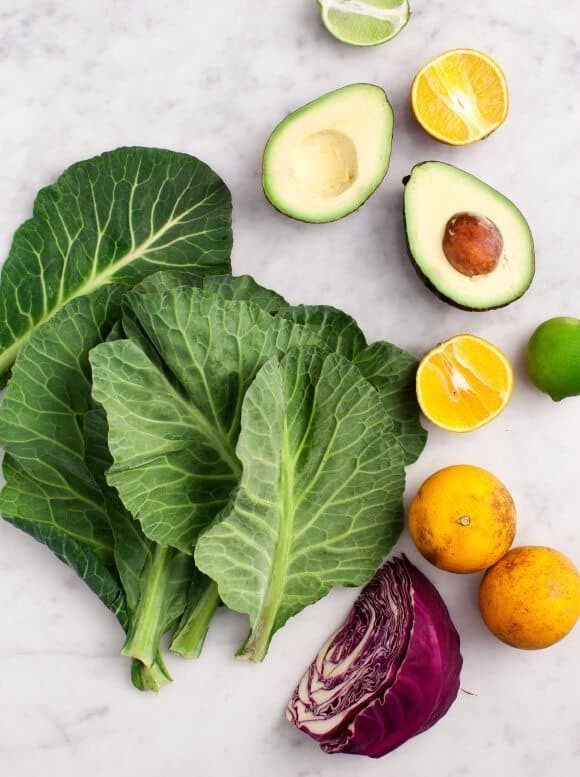 This lightened-up “taco” recipe is inspired by these gorgeous collard greens that were in my Farmhouse box a little while ago. How pretty are they?? 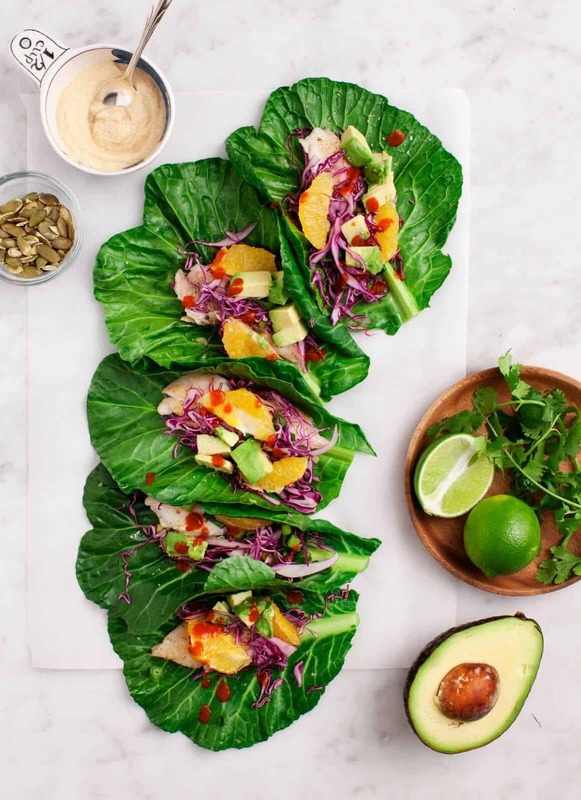 Along with local oranges, a chunk of red cabbage, a few limes, and an avocado, these wraps became a brighter, healthier version of fish tacos. The collard greens make delicious wrappers, but the key is to blanch them a little bit first. By dipping them in boiling water for about 10 seconds and putting them in an ice water bath, they soften and become a little less bitter in flavor. 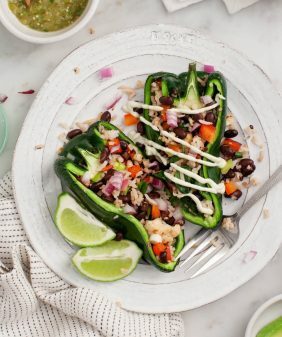 Instead of a sour cream type of sauce, I served these with my go-to creamy sauce that’s made out of sunflower seeds. I also added chipotle spices for a little kick. I should mention that you can use any protein you like here – I often make these with seared tofu (from this recipe) or tempeh (from this recipe). If you love using collards instead of tortillas, try these collard green burritos next! Or, if you’re looking for another taco recipe to try, make these yummy many-veggie tacos. Ditch the tortillas tonight and make your tacos in collard wraps! This fresh take on a fish taco works with a protein of your choice - I like tofu & tempeh, but real fish works too. Gluten-free. Make the chipotle sun cheese: In a blender, puree the sunflower seeds, water, garlic, vinegar, lemon juice, salt and chipotle paste or powder. Taste and adjust seasonings. Chill until ready to use. 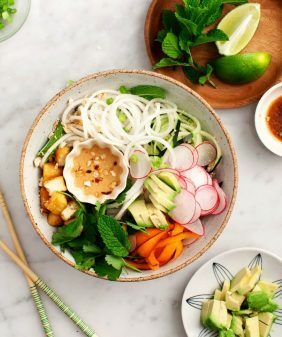 In a medium bowl, mix together the shredded cabbage, orange segments, any juice you can squeeze out of remaining orange rinds, scallions, lime juice, lime zest, and a few generous pinches of salt. Chill for at least 10 minutes, or until ready to use. Taste and adjust seasonings just before you serve. Prepare a medium pot of salted boiling water and a large bowl of ice water. Dip the collard leaves one at a time into the boiling water for 10 to 20 seconds until they turn bright green. Remove and immediately immerse into the ice water to cool for about 15 seconds. Place on papers towels to dry. Repeat with the remaining collard leaves. Before assembling, trim off the coarse part of the stem. Assemble the wraps with the protein of your choice, the cabbage slaw, avocado and cilantro. Serve with the chipotle sun cheese and additional lime wedges. If you use tempeh, use the cooking method from this recipe. If you use fish, drizzle tilapia with olive oil, a pinch of paprika, salt and pepper, and bake in a 350 degree oven for about 8 minutes, or until it flakes with a fork. Beautiful tacos! What a fun idea to wrap them this way! those greens are gorgeous and this recipe is a must-try! Thank you for it, will be trying it out soon. Wow…. 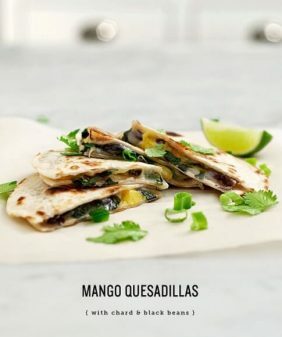 What an amazing recipe..
Just love the idea of replacing tortillas with the greens.. They look so nice! Wouldn’t have thought of blanching the greens, a great tip! Beautiful! Must try this week. I haven’t finalized my Door to Door Organics box (a necessity in 10,200′ high Leadville) yet. 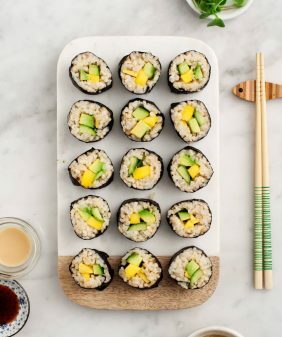 It reminds me a bit of the Salad Rolls sushi from Whole Foods that I love. In making the sauce, are the sunflower seeds soaked first? Hi Karla, thanks for pointing that out. If you’re using a high powered blender (like a vitamix) than it’s not necessary, but for a regular blender, soaking 3 or so hours would help. Thanks. I’ve got the sunflower seeds soaking, I can’t wait to try these tacos! 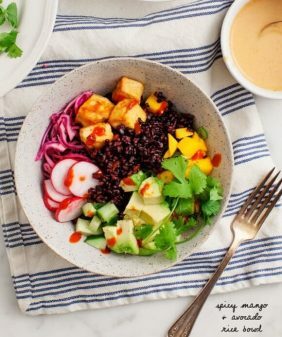 Love not only the fact that this is a healthier alternative, but you’re oh-so right… the colors are incredible! How much tilapia would you suggest? I’d suggest about 1 fillet per person (depending on their size) will fill about 3 wraps each. 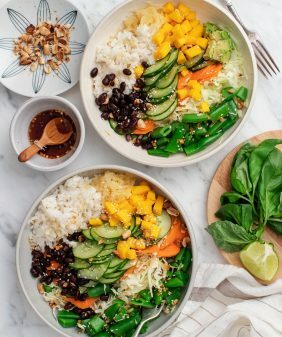 This recipe is so vibrant and summery! I can’t wait for the weather to warm up. These sound perfect for a barbecue or picnic potluck! I made these tacos tonight and they were absolutely delicious. This was my first attempt at making tofu, and the combination of the creamy chipotle sun cheese, fresh citrus, and savory marinated tofu was soooo yummy. The collard leaves were a little difficult to hold (probably because they were a little old and had torn in places) so I shredded them and turned it into a salad. This recipe is definitely going in my regular rotation! Thank you!